This is my essay for task 1 (IN IELTS8 BOOK). Pls! give me some comment. Thanks for your attendances! The line chart illustrates the amount of goods which is carried in the UK by four different sort of transportation during the period of time 1974 and 2002. Generally speaking, the major trend is upward. 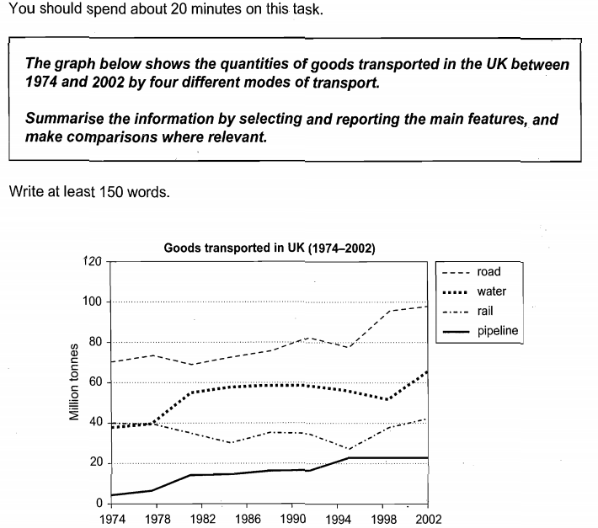 It is clearly seen that road was the most efficiency way to transport goods in UK. In contrast, the least amount of merchandise is taken by the pipeline. Particularly, in 1974 the quantity of goods which was imported to UK by road started with 70 million tonnes. From 1974 to 1994, the amount of goods which is brought in UK show a fluctuation but the main trend was upward. Whereas, the volume of merchandise which was transported by rail way started with 39 million tonnes and also show a erratic movement but the major trend was downward. After that, it dipped at 27 million tonnes in 1995. From 1995 to 1998, the rail and road goods transportation increased dramatically by 13 million tonnes and 20 million tonnes respectively while the goods capacity went through pipeline remain stable at 22 million tons. Afterwards, the amount of products which are brought in UK by pipeline still level off while the other ways show a gradual growth from 1999 to 2002. You have made a valiant effort but you still have a lot of work to do. Here are a few corrections and thoughts on part of your paragraph. This line chart illustrates the amount of goods carried in the UK by four different types of transport from 1974 through 2002. The overall trend in tonnage carried increased during the timeframe shown. Road transport was the most efficiency way to transport goods in UK. Thanhnam46 - efficiency levels are not expressed by your chart. All it shows is tonnage transported by method, per year. I believe what you want to say is that "the most tonnage was carried by road transport". In contrast, the least amount of merchandise was moved by pipeline. In 1974, the quantity of goods transported by road in the UK was 70 million tonnes. By 1994 road tonnage increased to 98 million tonnes. There was fluctuation during these years but, on average, the trend in goods transported by road increased. You seem to be confused by the words "transport" and "import". Nothing on your chart says anything about importing things. Using the corrections I have made, I suggest you begin again and pay close attention to the information that is provided by your chart. I'll be happy to help you with your next try. I WILL help you whenever you post to this thread. This is my new essay. Check it for me!!! thank you. The line chart illustrates the amount of goods which is carried in the UK by four different types of transport during the period of time 1974 and 2002. Generally speaking, the major trend was upward. It is clearly seen that the tonnage carried by road got the biggest quantity. In contrast, the least amount of merchandise was moved by the pipeline. In 1974, the quantity of goods transported in UK by road was 70 million tonnes. By 1994 road tonnage increased to 98 million tonnes. There was fluctuation during these years but, on average, the trend in goods transported by road increased. On the contrary, the tonnage transported by rail was 40 million tonnes in 1974 then decreased to 30 million tonnes in 1994. From 1999 to 2004, the goods moved by pipeline remain stable at 25 million tonnes whereas the rest increased with different degrees. The good transported by road and rail rise gradually from 93 million tonnes to 95 million tonnes and 39 million tonnes to 42 million tonnes respectively while the merchandise transported by water showed a dramatical increase from 51 million tonnes to 68 million tonnes. The line chart illustrates the amount of goods that were carried in the UK by four different types of transport during the period 1974 to 2002. Generally speaking, the major trend was upward. It is clear that the most tonnage was carried by road. In contrast, the least amount of merchandise was moved by pipeline. In 1974, the quantity of goods transported in UK by road was 70 million tonnes. By 1994 road tonnage increased to 98 million tonnes. There was fluctuation during these years but, on average, the trend in goods transported by road increased. On the contrary, the tonnage transported by rail was 40 million tonnes in 1974. This decreased to 30 million tonnes in 1994. From 1999 to 2004, goods moved by pipeline remain stable at 25 million tonnes whereas the others increased at varying degrees. Goods transported by road and rail during the same time period rose gradually from 93 million tonnes to 95 million tonnes and 39 million tonnes to 42 million tonnes, respectively. Merchandise transported by water showed a dramatic increase from 51 million tonnes to 68 million tonnes. Thank you! It is really helps me. Could you please help me with another essay next time? And I have a question. In the introduction part, should I compose 1 sentence rather than 2 sentences? which way is better??? JohnParis This line chart illustrates the amount of goods carried in the UK by four different types of transport from 1974 through 2002. It is worth mentioning that when talking about a range of numbers like that, use of the word through is part of American English in particular. It is not the case in the UK, where the correct word is to.